Stews are my favourite kind of dish as one dish encompasses everything- meat, carbo, veggies. Its not only healthy, tasty (even without adding much seasoning) but also comforting especially on a cold rainy night. 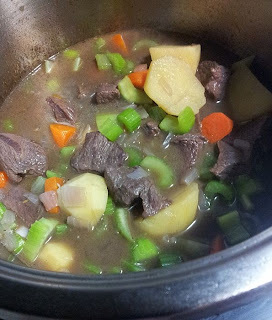 2 days ago, the weather was perfect for stew. So I took out my beef from the freezer to prepare for dinner tonight. I usually start preparing at about 2 pm. So that by 7 pm, the beef will be tender and the gravy will be awesome. This recipe is what I consider, a "lite version" as I did not add tomato paste to this and the gravy is not thick. I usually like eating this with rice. For the tomato paste version, I like eating it with either pasta or bread. So, its really your preference. If you want your gravy to be thick, then you just add cornstarch to it. 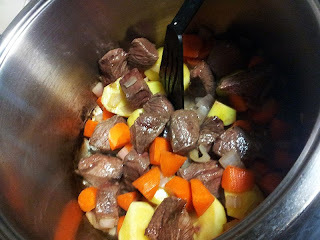 1) In a large pot, add vegetable oil and cook the beef over medium heat until brown. 2) Remove it from the pot. 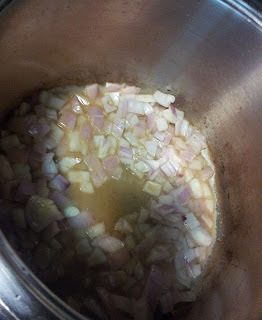 Then, throw in the onions and scrape the sides from the browning of the beef to add to the onions. Fry until its fragrant and the onions are translucent. 3) Put in the carrots and potatoes in. I prefer to put my celery till the very last part as I like it a little crunchier. Up to you. 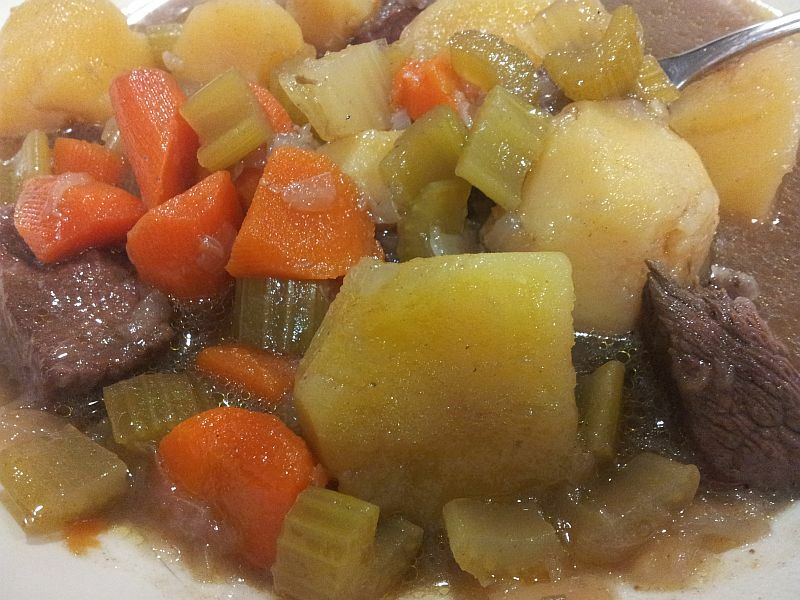 You can throw in together with your carrots and potatoes if you like. 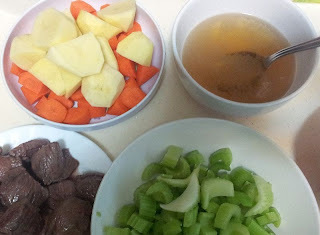 4) Then throw in your beef together and mix it around. 5) Pour the beef stock, water and red wine in to cover up all your ingredients. 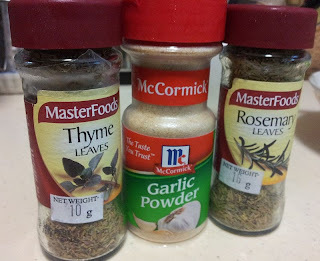 6) Then add in the dried herbs and seasoning with salt and pepper. 7) Let it boil before turning down the fire to let it simmer. I left it to simmer for about 3-4 hours. Test to see if the beef is soft before turning it off. I would throw in the celery at this point. 8) Remember to always taste your food to see if you are happy with the flavours. If not, just add something to it to balance it up. 9) Finally, I topped this up with my plate of rice with lots of soupy gravy.